Chopard made waves at Baselworld not only by showcasing a wide range of exciting novelties, but also by focusing on its newest drive for responsible production. The company made a pledge to use 100 percent ethical gold as of July 2018. The Swiss-based family brand has a long history of upholding a responsible business philosophy. Since 1978, for instance, the company has operated an in-house foundry to produce all of its gold alloys, which has allowed it to recycle up to 70 percent of production waste. In 2017, the company became the single largest buyer of Fairmined gold, and was directly responsible for a number of small-scale mines achieving Fairmined certification (which allows communal small-scale mines to sell their gold at a premium price, while also meeting strict environmental and social requirements). In the same year, Chopard also joined the Swiss Better gold miners’ improvement initiatives. Now Chopard has made a commitment to only use ethical gold. this new policy, which comes into effect in July, was announced at a press conference attended by friends of the brand, including Colin and Livia Firth, Julianne Moore, Arizona Muse, Noëlla Coursaris Musunka and Roy Wang. To this end, Chopard has defined ethical gold as “gold acquired from responsible sources, verified as having met international best practice environmental and social standards.” the simple fact that no one is already doing this speaks volumes of the inherent di culty in taking such a bold move in an industry that is not exactly known for transparency. Yet, it is also a critically important move, seeing as how up to 100 million people rely on gold mining as a livelihood. Even as it gears up to fulfill its 100 percent ethical gold commitment, Chopard has — perhaps unsurprisingly — announced its next set of goals. This ranges from ethical gemstones (certification for diamonds already exist, but the origins of coloured red precious stones are notoriously hard to trace) to meeting the 17-point plan for social and natural capital goals as laid out in the UN global goals. All that being said, it should be pointed out that “clean gold” has long been a part of Chopard’s offerings. The Palme d’Or awarded at the Cannes Film Festival, for example, has been crafted by the company using Fairmined gold since 2014. Same goes for the Green Carpet collection, the L.U.C timepieces, it is perhaps time to move on to some of Chopard’s best novelties for 2018. The Palme d’Or trophy wasn’t the only Chopard creation related to the Cannes Film Festival, as the brand has unveiled a timepiece inspired by the prestigious award of the happy Palm. To encapsulate the glittering magic of the famed lm festival, the happy Palm displays five moving diamonds and a miniature Palme d’Or that “dance” in front of an exquisite mother-of-pearl dial. The golden palm leaf itself is adorned with Urushi lacquer and decorated using the Japanese art of maki-e, where the dial motifs are traced with a dusting of fine gold particles. The Happy Palm is one of four 25-piece limited editions – along with the Happy Fish, happy snow flakes and Happy Sport Joaillerie – created as part of the 25th anniversary of the Happy Sport line. Naturally, a new interpretation of the original Happy Sport watch was also introduced, this time sporting a 36mm rose gold case and either a polished or a guilloché pattern, which makes for an ideal background for its seven moving diamonds. Among the many other new timepieces from Chopard, one that deserves a closer look is the L.U.C All-in-One. As a statement of the brand’s mastery of horological sophistication, the L.U.C All-in-One boasts not only exquisite design elements, but also ergonomic finishing touches and the largest number of complications ever fitted into a single L.U.C watch. 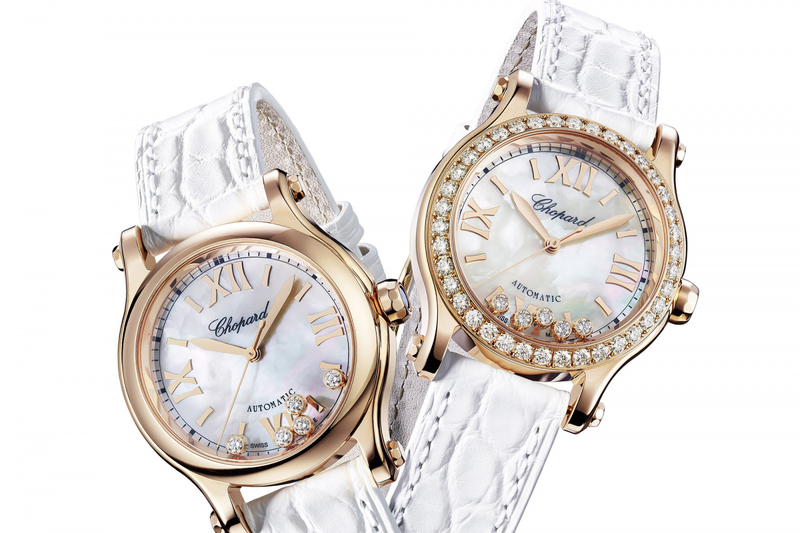 From ethical business practices to red carpet glitz and grand complications, Chopard is definitely having a happy year.